Weibo and WeChat are the two largest social networking platforms in China. They both exert significant influence in Chinese society and play an indispensable role in modern life. Weibo provides microblogging services that are the equivalent of Facebook and Twitter combined. By September, 2016, the number of monthly active users on Weibo had already reached 297 million. WeChat is a mobile application providing instant messaging services. It was first released in January 2011 by Tencent. By September, 2016, the number of daily active users on WeChat had reached 768 million. For branding on Chinese social media, Weibo and WeChat are definitely the best choices. However, each is best suited to different communication methods and branding purposes. After registering an account, users can post content or push feeds to their subscribers. Relatively speaking, Weibo is a more open platform. Akin to Twitter, even non-account holders can view Weibo posts and its posting default setting is public. In addition, everyone can also see the reposts, comments or likes. ↑ A Weibo post by the People’s Daily official account with users’ reposts and comments shown publicly below. 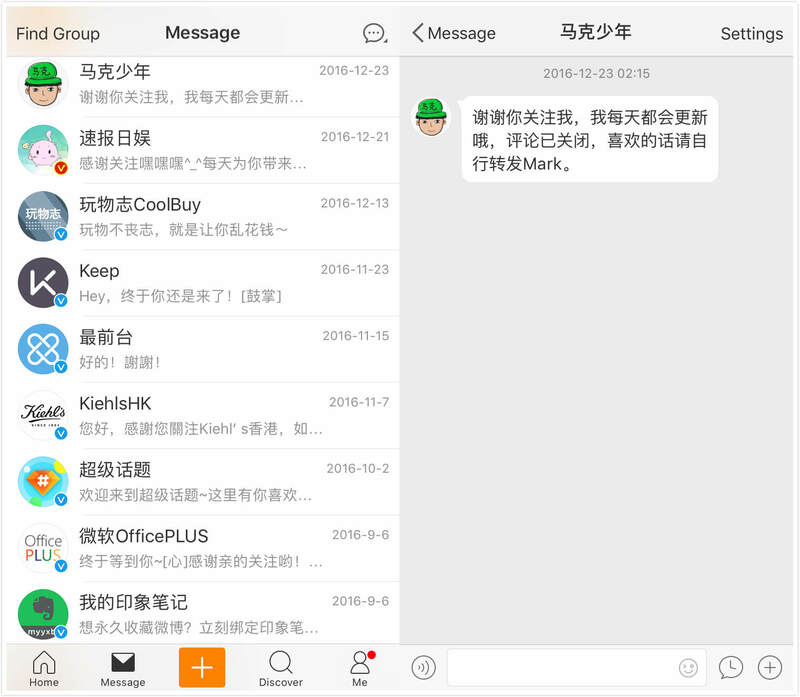 Unlike Weibo, WeChat is sort of like a close community. Normally, WeChat users can only see posts pushed by official accounts to which they subscribe. But they can also search and read posts published by other accounts by inputting keywords in the search bar within WeChat even if they don’t subscribe to them. Generally, WeChat users only subscribe to content they’re interested in so it’s much easier to directly target existing and potential customers in WeChat than in Weibo. 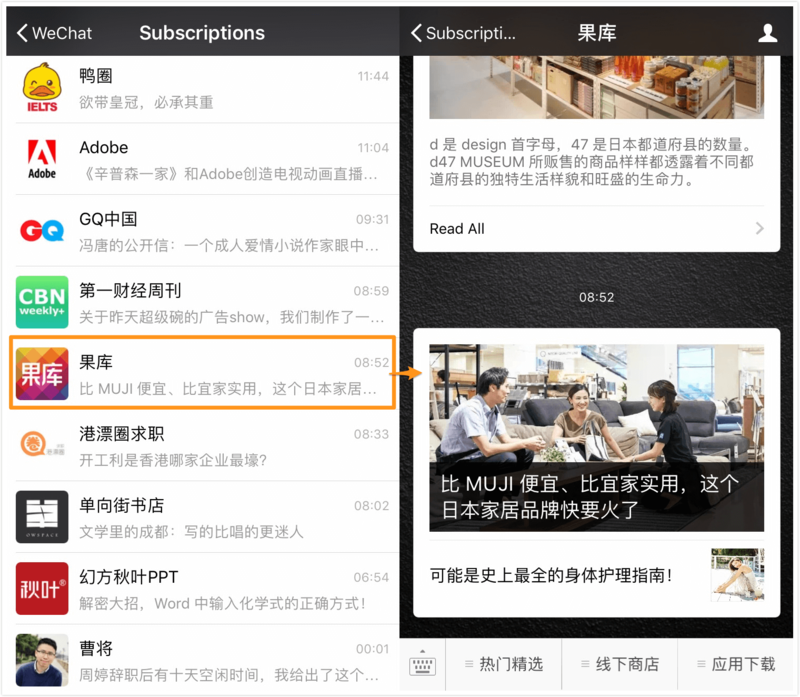 ↑ The “Subscriptions” folder in WeChat shows the official accounts you subscribe to and all their push messages. In WeChat, users only share information with people that they’re close to, like relatives, friends and colleagues so it’s a more private platform that encourages a higher level of interaction and greater motivation to share. 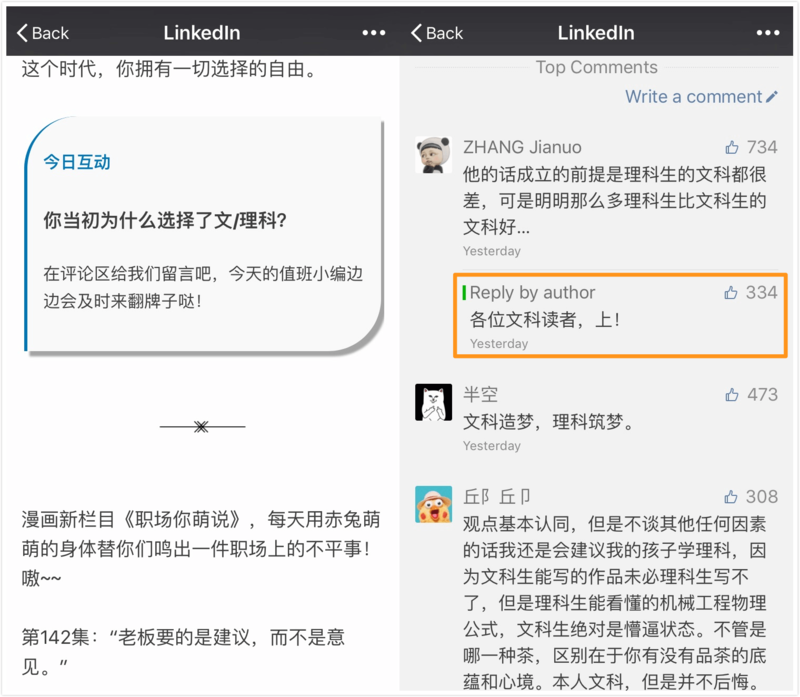 If someone shares a post on their Moments (朋友圈) page, this works as powerful word of mouth to their personal networks. 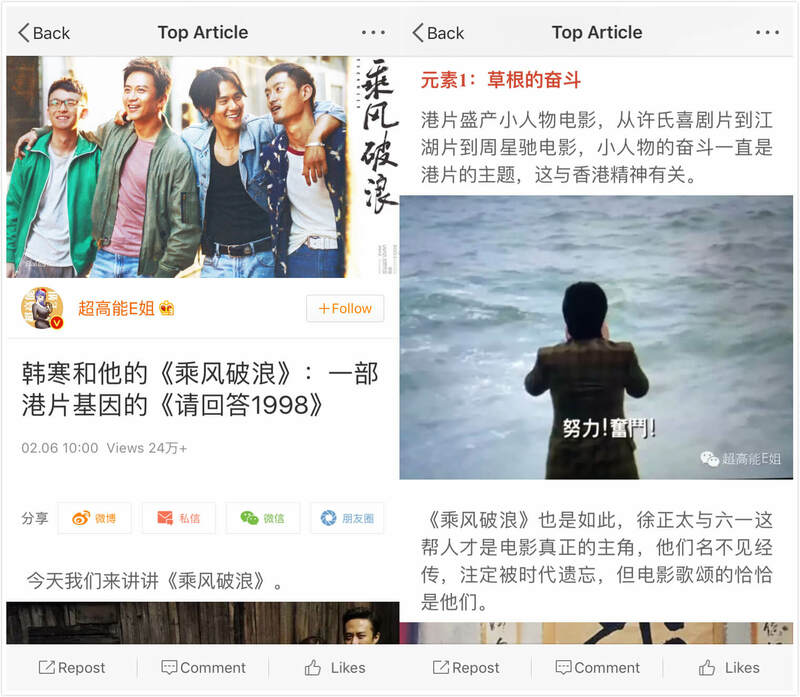 ↑ WeChat users share push articles on their Moments page. Weibo is more suited to mass broadcasting. WeChat, with its higher level of privacy, is more suited to in-depth and exclusive communication, since the messages can be only seen and sent between two parties. Weibo is designed to be a microblogging site. In the past, regular users’ Weibo posts were limited to no more than 140 Chinese characters and only VIP users could go beyond that. The limit has been relaxed now and any registered user can post up to 2,000 Chinese characters or use the “Article” function, but short posts are still the most common. 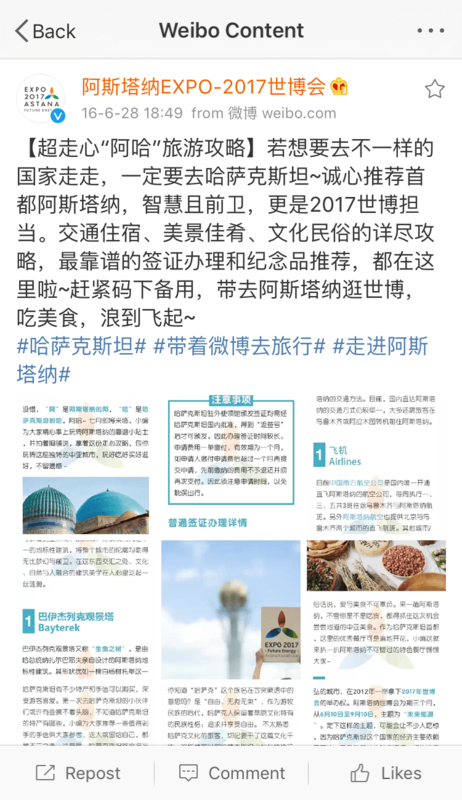 ↑ An example of a Weibo post from the Astana Expo 2017 official account; a short post with nine photos and hashtags, which gives detailed information about travel to Kazakhstan. ↑ An example of a Weibo article; a review of the movie Duckweed written by a KOL. On WeChat, the content that users like to repost are multimedia articles with text and photos/audio/video. This makes it a good forum for long, detailed articles to introduce the brand. When editing articles for WeChat, highlighting the most essential parts is important. Content on the platform is fast-moving so posts needs to be easy to skim. Attractive visuals and well-designed layout are also important to retain readers. ↑ An example of a push article from the LinkedIn official account with elements that make the layout clear and improve readability – a banner image that includes icons, subtitles, bold characters, clearly marked headings and a chart. 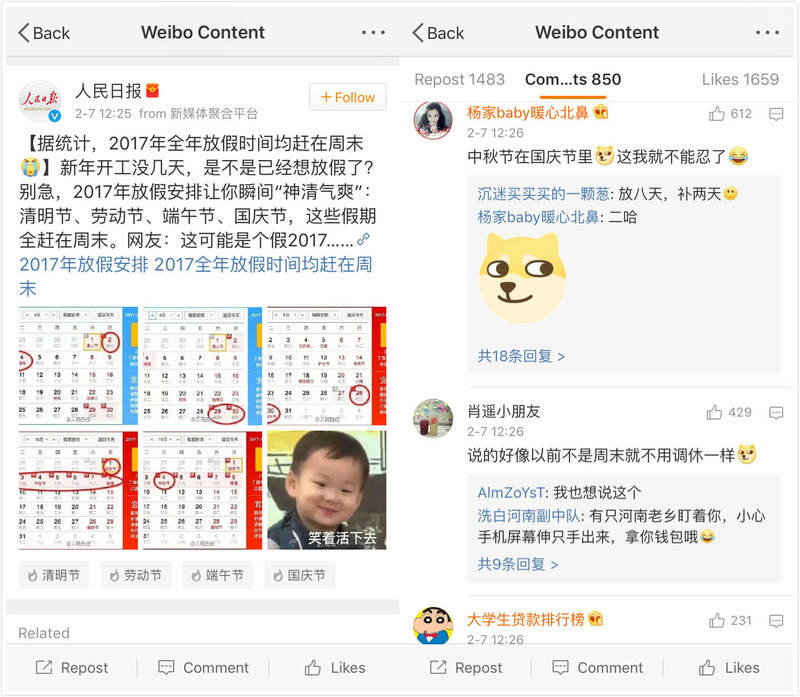 On Weibo, there’s no restriction on the number of posts per day and it’s advisable to post regularly to keep a presence in your followers’ feeds. In such a fast-moving consumer goods industry, users can post every hour or two or 3-5 times daily. For WeChat official accounts, the post frequency depends on the account type. For subscription accounts, only one post can be pushed per day but that post can contain up to eight articles. For service accounts, users can post four posts monthly. Generally, one to three articles are enough for one day’s feed. Too much information may leave readers overwhelmed. 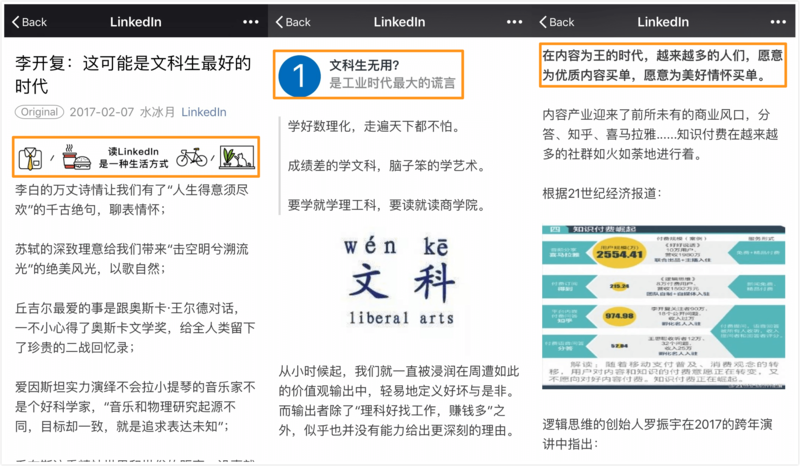 ↑ The official WeChat account of LinkedIn updates every day with one to three articles. For branding on Chinese social media, the language style should match the brand image and also suit the platform and audience. Given that Weibo is not for long-form content and works best to drive traffic to promoted products or services, ensure that posts are concise, interesting and clear. Photos, videos, Biao Qing Bao (表情包, memes) and informative GIFs convey information and act as incentives for readers to repost. For longer articles on WeChat, the language style can be more formal, more professional and more detailed. Liking: Account managers may “like” a post that showcases their brand or that speaks highly of its products or services. This shows appreciation and gratitude while drawing attention to the post. Comments: Account managers may comment on a user’s post or reply directly to his/her comment. Reposts: Account managers can repost a KOL’s (key opinion leader’s) post about their brand or repost general users’ positive testimonials and questions with a response. Messages: This is a more private form of interaction as only the sender and account manager can see the messages. This kind of communication is primarily used as a form of customer service – to deal with complaints and to help customers solve problem. ↑ The message function in Weibo allows accounts to send automated and personal messages to their followers and allows followers to contact the brand account with feedback and enquiries. WeChat is a semi-closed platform so the interactions between the account manager and the user are more personal. Direct messages: Users can send a message to the official account. If the message contains certain key phrases, they may get an auto-reply or there may be a personal response from an account manager. ↑ Account managers can feature high-quality comments and reply to them. No matter which platform you plan to choose to start your branding on Chinese social media, high-quality content that users repost is the most important element. Unique, rich, interesting content helps to keep subscribers attracted loyal followers. This requires focus and sustained effort. In addition to quality content, the following ingredients are key to an effective marketing strategy. Key opinion leaders play an important role in both Weibo and WeChat marketing. They’re bloggers, celebrities, authorities or professionals in a certain industry that have a huge number of followers. On Weibo, they’re usually paid to produce original Weibo posts related to the promoted products or services, repost a brand’s posts or co-organize online activities with brands. The social influence of KOLs is enormous. KOLs not only encourage followers to repost and comment but also help to convert them into customers. On WeChat, KOLs have official accounts with lots of subscribers. This means their posts are reached by a large, loyal audience. The most common form of cooperation with KOLs involves sponsored content creation. Brands find a KOL who likes their products and is a good fit for them. They then negotiate and arrange for them to write promotional articles and recommend their products or services. Unlike in some other jurisdictions, these posts do not need to be marked as “sponsored”. The content is often advertorial in nature with the reader not aware until the end of the article that it is, in fact, promotional. ↑ Yansubagua (严肃八卦) is a well-known official WeChat account that publishes celebrity gossip and entertainment news. Many brands have cooperated with the account manager to produce promotional material because of its huge subscriber base. For example, the article above starts with information about movie star Aarif Lee and ends with a purchase link for a jewellery brand. Readers can’t tell from the headline that this is an advertisement. 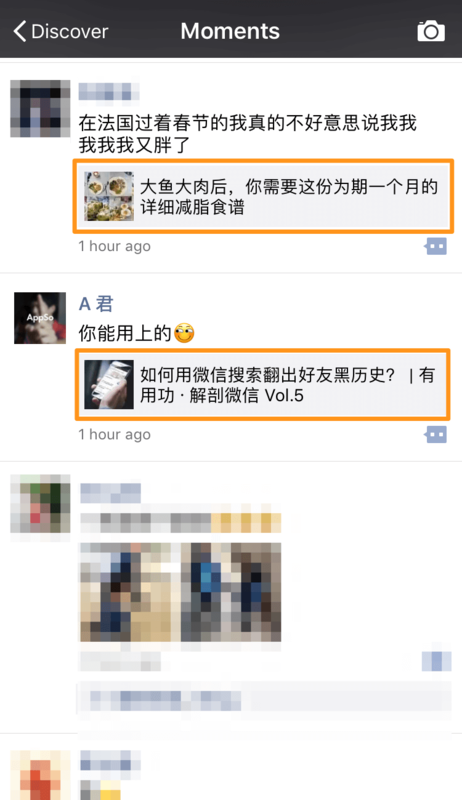 Following hot topics is also very common in branding on Chinese social media. If account managers can develop interesting posts related to the most popular issues, the account will stand out and gain popularity. For Weibo, account managers can also add hashtags to increase searchability. 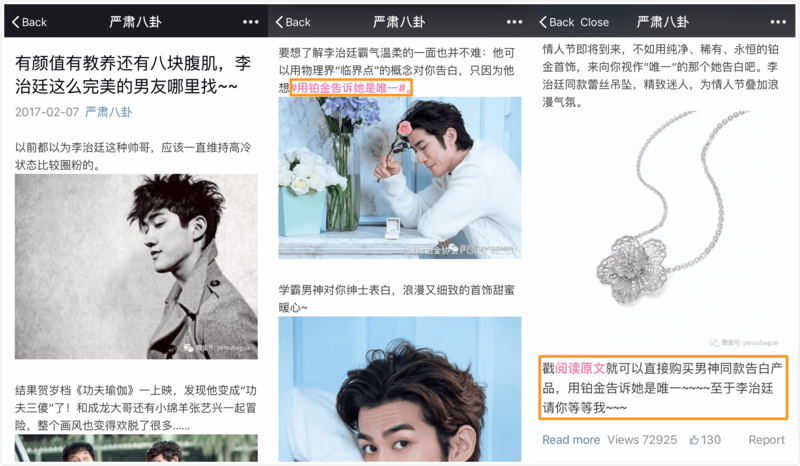 ↑ On February 14th, most WeChat official accounts push Valentine’s Day-related content, including Guoku, a goods recommendation platform, and The Bund, a digital magazine based in Shanghai. 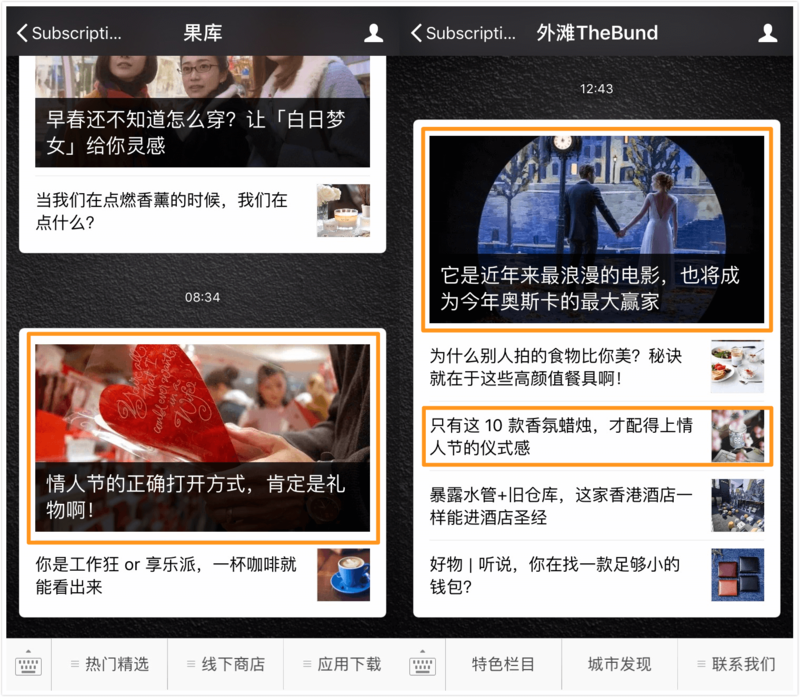 Campaigns are another important aspect of Weibo marketing. Users like to take part in interesting, creative campaigns, especially when a prize is on offer. For example, in return for reposting or liking your content or submitting original content, users can get a chance to win a prize. This is an effective way to generate traffic and gain popularity. WeChat online campaigns are different from those on Weibo. 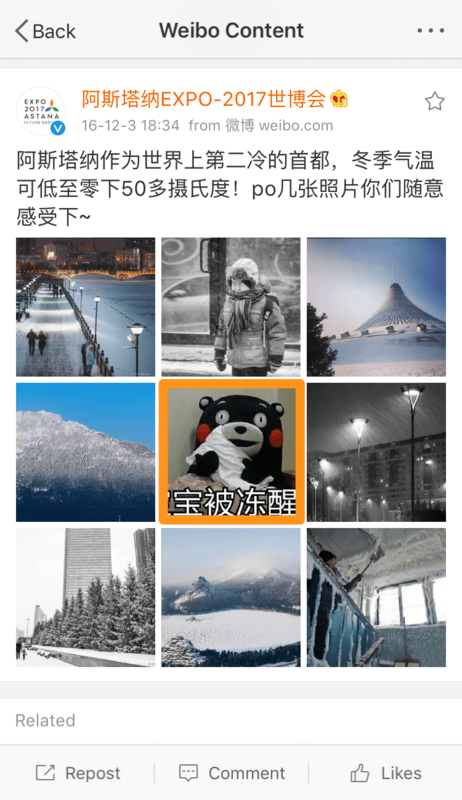 WeChat doesn’t provide any official campaign formats but account managers can still run campaigns encouraging readers to repost to their Moments page or to their friends to win a prize. They can also give their audience useful resources or design H5 pages for events, brand promotions, product introductions and more. Because of Weibo’s open, public nature, the relationship between its users is not that strong. Users don’t have to follow a certain account to read its posts. However, information on Weibo changes frequently and spreads exponentially. In this sense, Weibo is a particularly good choice for brands that want to increase their corporate exposure, build their brand image and launch marketing campaigns. WeChat maintains a relatively intimate relationship with and between its users since most WeChat contacts are friends and acquaintances. In addition, users generally only subscribe to official accounts that push content they’re interested in. As a result, it’s more efficient to target current and potential customers on WeChat. What’s more, the instant messaging function allows users to contact the brand directly so WeChat is also well-suited to sales conversion and customer services functions. In sum, for branding on Chinese social media, Weibo and WeChat each have their advantages. You don’t have to make an either-or decision right away. Instead, we suggest you use both platforms and make full use of their respective strengths to set up your marketing strategy. 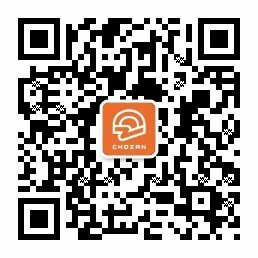 Do you want to learn more about the features and functions of Weibo and WeChat? Do you know how to grow followers on Weibo and WeChat? 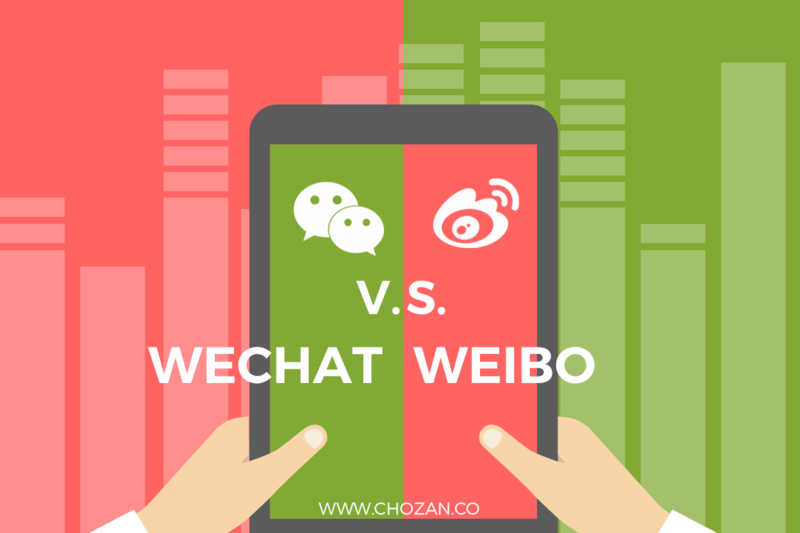 Do you know which WeChat official account suits you best? Leave a comment below. We’d be happy to answer any questions you may have.